Phero Pizzle features The Star Boy records CEO Wizkid aka Daddy Yo on this one. The versatile rapper trap and afrobeat singer declared that his track will drop on the 27th of May. He promises his fans to expect a dope single with good lyrical content. He said "Have been busy in the studio trying to release a new single pick up the phone ft wizkid. I promise you a very good song and a big hit all I need is your encouragement and support. 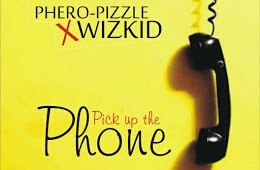 0 Comment to "Phero-pizzle ft Wizkid - Pick up the Phone #Pherorefix @Wizkidayo"